Bacon Cheddar Ale Soup: An easy take on a classic pub food. Creamy, cheesy, bacony, and with a touch of ale flavor, this soup is a winter night’s winner of a meal. It’s hard to describe how picky I am about certain things. Soup is one of those things. In my [not so] humble opinion, creamy soups should be, in fact, creamy and not even a little bit watery. And broth-based soups should have enough substance to them to consider them a meal or at least a light meal. They, of course, should not have too much substance so that there’s no liquid left to slurp. I don’t know. I can’t be the only one who feels like way, can I? One of my favorite local restaurants, which has the best wings around BTW, is also really well-known for their cheddar ale soup. To me, it’s a mighty fine soup, except that it lacks just a teensy bit in the ale flavor. But the texture is spot-on and it’s so creamy that it almost takes two licks of the spoon to clean it. I almost always order a cup when I’m there, even in the middle of summer. And for years, I’ve considered trying to duplicate the soup at home. 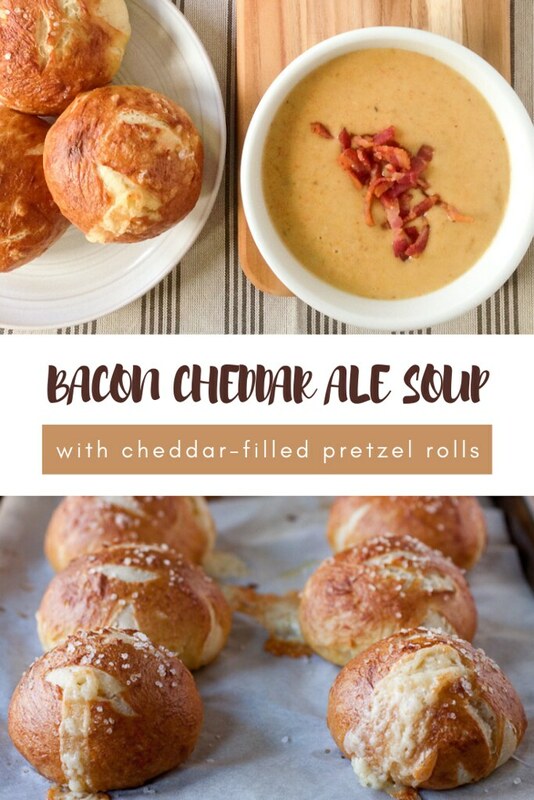 So along with those cheddar-filled soft pretzel rolls I attempted to make a few times last year/winter came a few attempts at making this bacon cheddar ale soup as well. I should have known this already based on a failed beer mac and cheese recipe I made last winter. Those were dark days in my kitchen. But after tweak here and a fiddle there, I finally found the right combo for this soup! And it’s SO easy to make too! You’ll start with bacon, then add chopped veggies, flour, beer, broth, and milk, and end with shredded sharp cheddar. 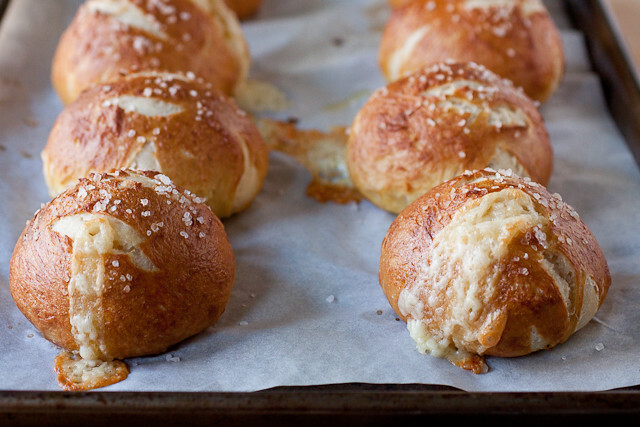 Any recipe starting with bacon and ending with cheese should already stop you in your tracks. Am I right?! 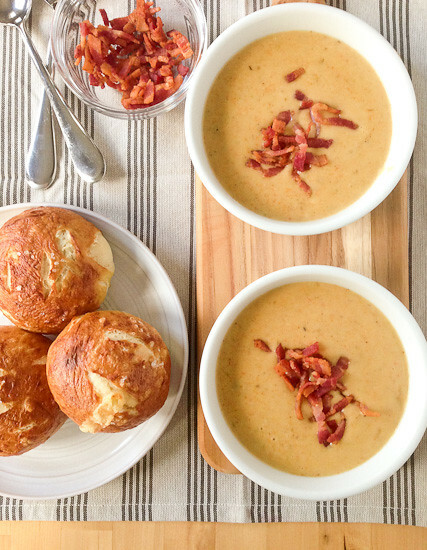 But dip some of those pretzel rolls in this bacon cheddar ale soup and you’ve got yourself one heck of a perfect wintery night comfort meal. It’s quick enough to make on a weeknight, especially if you cut the veggies in advance. And it’s one of those fill-your-belly soups that won’t leave you hungry an hour later. Win-Win!! To make this a vegetarian cheddar ale soup, saute the vegetables in 3 tablespoons of canola oil or unsalted butter instead of the bacon fat and swap the chicken broth for veggie broth. This recipe makes 2 good-sized dinner servings or 4 appetizer servings. The recipe can be easily doubled but depending on the strength of your beer, you may want to adjust the amount you add according to your tastes. A half bottle (6 oz) in the recipe below adds a good “punch” of beer flavor to the soup. Cook the bacon in a large saucepan or small Dutch oven set over medium-high heat until crisp. Scoop out the bacon with a slotted spoon and allow it to drain on a paper towel-lined plate. Drain off all but 3 tablespoons of the bacon fat. Turn the heat down to medium, add the leeks, carrots, celery, ½ teaspoon salt, and ¼ teaspoon of pepper and saute for 8-10 minutes, stirring occasionally, until the carrots and celery start to soften. Toss in the garlic and cook, stirring, for 30 seconds until fragrant. Whisk the flour into the vegetables and cook, stirring constantly, for 1 minute. Whisk the chicken broth into the saucepan vegetable mixture to deglaze the pan and whisk until no lumps of flour remain. Blend the mixture in the saucepan until smooth with an immersion blender or transfer the mixture to a blender and blend until smooth then pour the mixture back into the saucepan. Stir the beer into the pan, bring to a simmer, and stir as needed – watch carefully because the beer can cause the mixture can boil over. Allow the soup to cook down for 10 minutes then stir in the milk and allow it to warm through for 1-2 minutes. Stir the cheese into the soup by the handful, allowing each handful to melt into the soup before adding the next. Season with salt and pepper to taste. Garnish with the cooked bacon before serving.